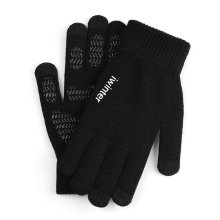 Three sensitive finger tips, anti-skid gel grains in hand and napping lining, this gloves is designed for convenient winter use. Three sensitive fingers tips for free phone use. Anti-skid gel grains in hand for firm grip. Windproof acrylic shell and napping lining to keep hands warm in winter. Soft and with moderate elasticity, one size for most people.